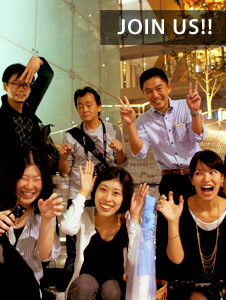 Group photo in Marunouchi before the start of the tour. 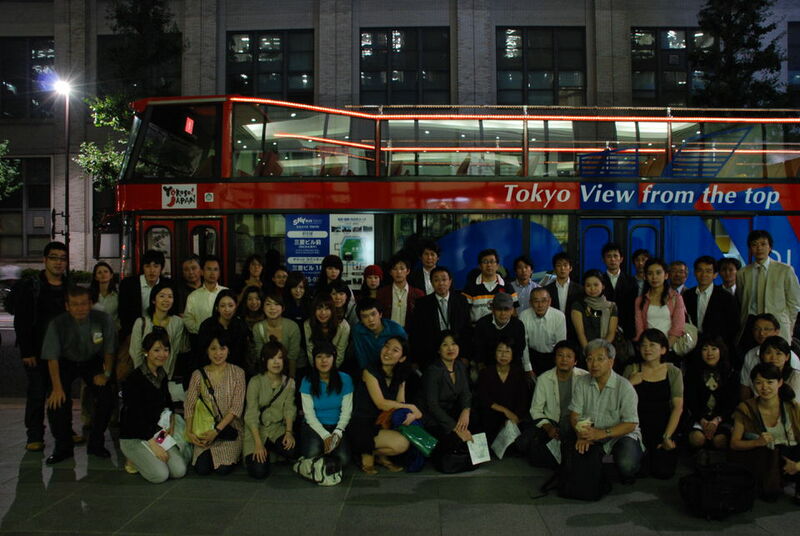 An air of excitement and anticipation as members boarded the bus for the 2-hour night tour of Tokyo. 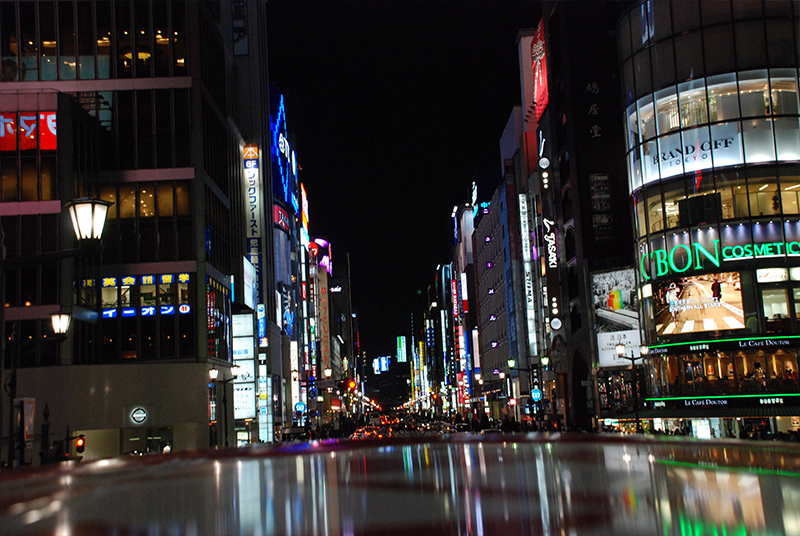 Driving through the heart of Ginza was the highlight for many on the tour. New and old methods for street and facade lighting were on parade, an excellent opportunity for comparing and contrasting lighting eras. Office tower lighting and residential condominium lighting dominated the scene on the drive back from Odaiba to Marunouchi. While white fluorescent lighting was the predominate color some condominiums glowed a soft orange. Members all had stiff necks after 2-hours of continuous looking up, but nobody seemed to mind. Chatter even died down as the bus started along the route, as members seemed to take this opportunity very seriously. 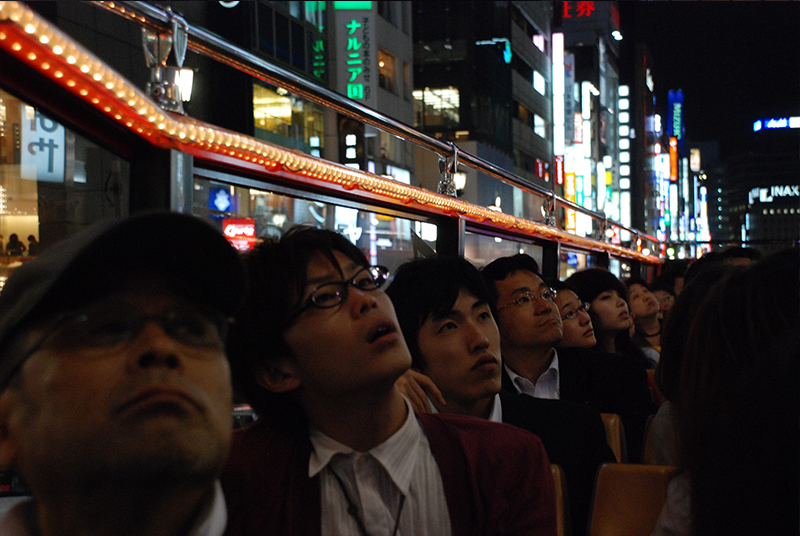 The Lighting Detectives are always up to something unusual and for this city walk we rented a double-decker, open-air bus to cruise the streets of Tokyo. A specially planned route took us from Marunouchi→around the Imperial Palace→past the Diet→through the middle of Ginza→across the Rainbow Bridge→around Odaiba→back through Toyosu→across Kachidoki Bridge→up Haruumi Avenue→back to Marunouchi. It was a neck-kinking, eye-popping, wind-in-your-hair tour! 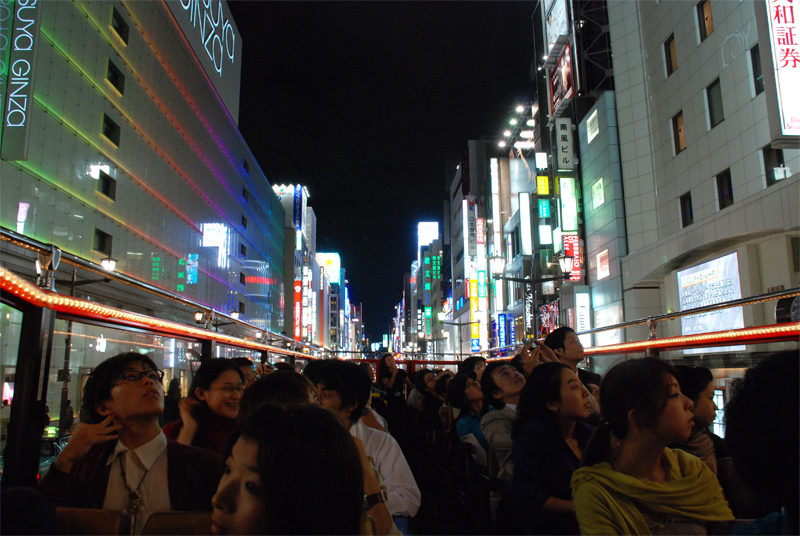 It`s a rare thing to drive through the main streets of Tokyo, but even rarer to be seated on a double-decker bus night tour of Tokyo! Not only is your view transformed from a pedestrian on the sidewalk to the top of a bus, but also driving down the middle of Ginza and across the Rainbow Bridge are one-chance opportunities. The intimate tour of Ginza`s main drag and its famous boutiques was exceptional in itself, but my personal favorite was the long view of Tokyo from the Rainbow Bridge and Odaiba. Up close Tokyo is a very bright and lively place, but as the skyline shimmered in the Tokyo Bay, you tend to forget all of the bustle and overly bright signage of the megalopolis and focus on the bigger picture. While white light and luminous signage dominate this view it is easier to digest against the black waters of the bay than when it is just a few feet away. 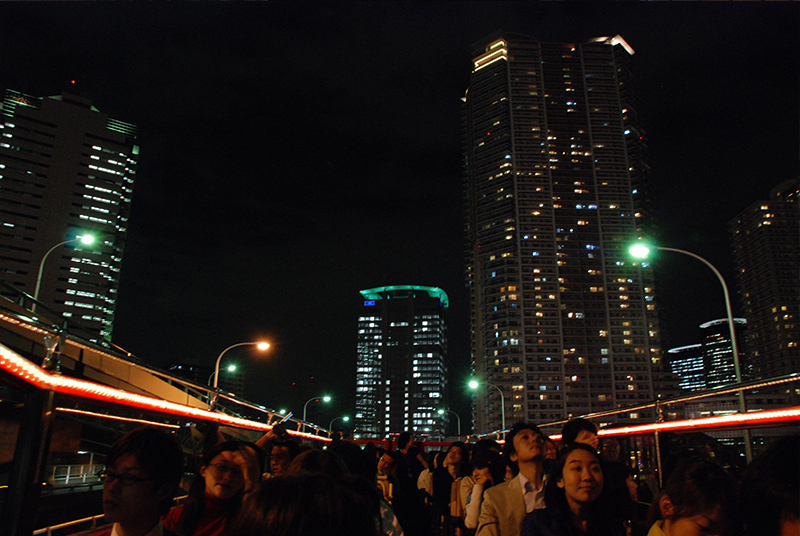 It is actually somewhat relaxing to view the city for afar and Odaiba is a fantastic place to do just that.